The city of Manistee is an exciting place to live and a wonderful place to visit. With its location along Lake Michigan, you can enjoy fantastic fishing, boating, and swimming. The Manistee-Huron National Forest, which stretches for miles, offers hiking, biking, and camping. Within the city, you can watch a production at the Historic Ramsdell Theater, and stroll the very popular Manistee Riverwalk. Click here for a map of the Riverwalk. 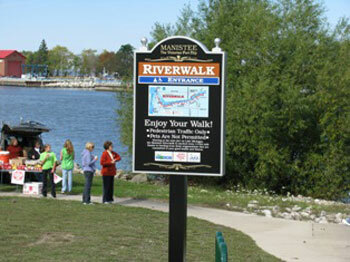 13 signs have been placed along Manistee's famous Riverwalk, with mileage markers every tenth mile to track your distance. It's the goal of the Healthy Manistee County Coalition to get residents out and about, promoting a healthier lifestyle. There are also markers posted along the way that point out historical sites of importance.